When I first started doing agility, a local instructor told me “train like you show, show like you train”. Take that mantra and apply it to everything you do to prepare yourself and your dog for your agility career. Because dogs don’t generalize, the more you can recreate that trial environment when you train, the better prepared you will be when you step into the ring. There are many things you can do to train smarter for agility trials. Of the three main agility venues, only AKC allows collars, and that collar can’t have hanging tags. Train in the collar you are going to show in, train with the leash you are going to show with. Go the line of your handling sequence in agility class with that leash on and go through the process of taking it off and throwing it off to the side. Trust me, those steps affect some dogs! I have seen dogs take off after their leash, it’s a toy right? (except in NADAC, no tugging on the leash allowed, have you practiced that??) I have also seen the handler project stress to the dog as they remove the leash because they are not used to grappling with a slip lead, handler gets in a hurry, dog gets stressed, not a good situation at the start line. And speaking of leashes, have you practiced putting it on after the run? Some dogs need to practice the ritual of coming to the handler, getting caught and having the leash put on. Don’t lose that first Q because your dog runs out of the ring (in AKC) or grabs the leash and has a big tug fest (NADAC). I know handlers who have taught their dogs to target the leash, to keep an over aroused dog from jumping up and taking them out with excitement (can’t do this in NADAC). In a typical AKC or USDAA course there are approximately 15 – 17 obstacles per a 100 by 100 square foot area (give or take). That’s an average of 16 obstacles per 10,000 square feet. How big is your training facility? If you are training in a 60 by 60 square foot facility, you should be using 6 obstacles or so. There should be a distance of 15 – 18 ft (AKC) to 20 ft (USDAA) between obstacles (possibly more for NADAC or USDAA snooker). More obstacles does not equal a better training situation. Cramming too many obstacles into too small of a space does not replicate the trial experience and is potentially unsafe. Off course options should be a minimum of 13 ft (AKC) away. That includes the dog walk legs, side of the chute, etc. 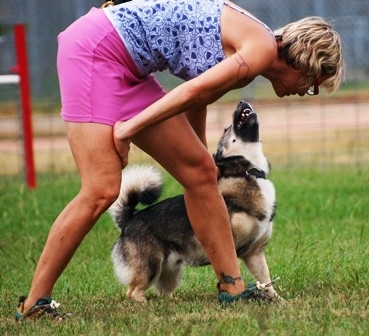 Setting up a short, meaningful handling sequence that allows for reinforcement when the dog is correct makes way better “train like you show, show like you train” sense. If obstacles are crammed into a too small space, dogs don’t get a chance to open up and make choices based on handler movement. You may find that when you go to a trial, you can’t get to where you need to go and your dog is busy taking the next obstacle in their path instead of paying attention to the handler. On the topic of obstacles, look around at your training facility, do the jumps have wings? Fifty percent of an AKC course and the majority of an USDAA course must have wings. If you do NADAC, none of the jumps have wings. It makes a difference, visually to both the handler and the dog to run a course of winged jumps vs non-winged jumps. Set the course to mimic what you are going to trial on. Are the contacts at your training facility slatted? Rubberized? AKC and USDAA have a slatted a-frame and dog walk, NADAC is slat-less. Have you looked at the surface of the contacts you train on? Although I am not a fan of slats, it does affect a dog to do a slat-less dog walk when they are used to a slatted dog walk, some dogs get confused and think it is the teeter (the teeter is the only slat-less contact obstacle in AKC and USDAA). Also, be aware that the length of the yellow contact zone is different in AKC and USDAA for both the dog walk and the teeter. Reinforcing and rewarding behaviors is a key part of dog training but can’t be done in the agility ring. It is important to fade rewards in preparation for trials. Leave the food hidden somewhere and run to it after a successful sequence. Have a friend hold and throw a toy. Stop rewarding every contact (don’t want to go through an extinction behavior on the dog walk because suddenly you are not rewarding the 2O/2O), use verbal praise, change the number of obstacles you do before reward (don’t just do more and more, jump around from 2 to 6 to 3 to 14, etc). Verbal markers are allowed in the agility ring, you take your voice into the ring with you, so if you have been training with a clicker, consider switching to ‘yes’ as your marker. You can mark contacts, weaves, tight turns, etc on the agility course. This entry was posted in Agility and tagged dog training, train like you show by ffluffy. Bookmark the permalink.